Sept. 27, 2013, 9:30 a.m.
By Justin Ellis @JustinNXT Sept. 27, 2013, 9:30 a.m. When The Texas Tribune launched in 2009, Evan Smith says the nonprofit news site was in a “proof by assertion” stage. The assertion, in this case, was that there was an audience hungry for intensely focused-coverage of Texas politics and the industries, agencies, and personalities who inhabit that world. Four years later, it’s safe to say they were right, as the Tribune has become a success story in the world of online journalism and nonprofit news — a model both for its journalism and its business sense. One measure of that business success? This year the Trib is on track to generate a cool $1.2 million on events and conferences. (That’s up from around $800,000 last year.) Smith mentioned that figure publicly earlier this month, so I thought I’d ask him about that milestone. The more, in this case, will depend on how the remaining events the Tribune will hold in 2013 turn out — including its biggest event, The Texas Tribune Festival, which begins today. Echoing the The New Yorker Festival, the Tribune Festival is a three-day extravaganza of education, health care, transportation, energy, and other topics that click with the Tribune’s audience. The lineup of speakers for this year’s festival includes some hot names of the moment, like noted endurance orators Ted Cruz and Wendy Davis. Smith said he expects between 2,000 and 2,500 attendees at this year’s festival, and at a ticket price of $225 a piece, that translates into substantial revenue. Add in sponsorship packages and it’s not difficult to see how the numbers add up to a record year. 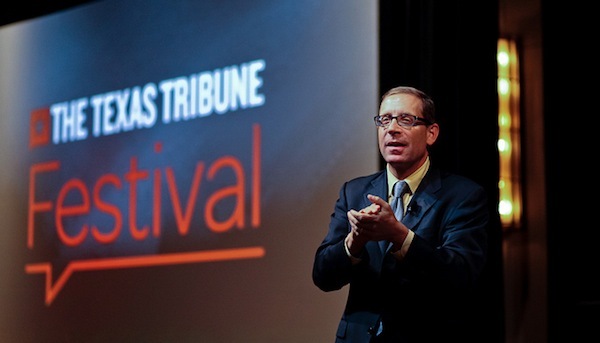 But for all its size and stature, The Texas Tribune Festival only accounts for about 40 percent of the company’s events revenue, Smith said. The rest comes from sponsorships of talks, panels, and other events the Tribune convenes throughout the year. It’s why Smith is so bullish on events and the potential they hold as sources of both content and revenue. “Make no mistake: It is the rocket booster of this operation,” he said. The Tribune does between 60 and 70 events annually, which range from conversations in the TribLive series to panels, receptions, and symposiums. While the Tribune holds a number of those events in Austin, many are held on location around Texas. This year, the Tribune has hit San Antonio, Dallas, and Houston, with future stops in places like Waco, Lubbock, and Fort Worth. For its Hot Seat events, the Tribune partners with a college — places like University of Houston, Southern Methodist, or Texas Christian. Next month at Texas Tech, the Tribune is bringing together three state legislators from the Lubbock area for a lunch time talk with people from their district. Smith said spreading out across the state means you can hold discussions on issues of regional importance, but also put state officials in front of audiences they may not meet regularly. That’s also the case for the Tribune, Smith said, as in-person events around the state can introduce the site to new people. “I think there’s unlimited opportunities around the state to bring this content to college campuses,” Smith told me. It’s also an advantage of the Trib’s model — focusing on state government — since each election brings a new set of capital—hinterland connections. The talks, panels, and other events hosted by the Tribune are meant first for a live in-person audience. But because each event is filmed the talks can find wider audiences online, Smith said. “I think to be able to catch up on things on the site is a great benefit,” Smith said. But rather than just slapping a two-hour video on the web, Tribune staffers select clips and snippets of conversation to break out as individual videos around important topics or themes. By packaging videos to supplement the conversation, the Tribune is able to extend the life of the event in new ways. For instance, it would be easy for the Tribune to put together a video series on candidates for the upcoming governor’s race from clips from TribLive events. The videos can perpetuate a kind of loop. Each new video allows potential speakers and sponsors have another chance to see the work the Tribune does and how they could be involved, Smith said. It also keeps the events top of mind for the audience. “The best advertisements for the events are the events,” Smith said. The Tribune keeps a busy schedule. In October, they’ve already got six events on the books, one just days after festival. April Hinkle, the Tribune’s chief revenue officer, told me they like to plan a slate of events early, which allows companies to figure out how an event sponsorship fits into their marketing budget. Some companies will sign on as a presenting sponsor for TribLive talks for the year, which for $30,000 gets them plenty of branding and mentions in promotions, at the event and on the accompanying videos. At the Tribune Festival, companies have a broader buffet of sponsorship options, which range in price from $5,000 up to $175,000, Hinkle said. The price points offer different levels of visibility, and options like operating a booth, handing out literature, or hosting receptions, she said. Even with that set calendar of talks, panels and other activities, the Tribune leaves a lot of flexibility in its calendar for the kind of timely or topical subjects that come up over a year. That’s how you get events about transportation, water resources, or the future of Latino health care in Texas. Hinkle told me sponsorships for individual events start at $3,000, or $7,500 for a series of three. Now that the Tribune has been around for four years, companies have a sense of the site’s readership, what to expect out of the events, and how they can reach specific audiences, Hinkle said. “Really what we try to do is understand what sponsors are trying to achieve, and then use as many Tribune assets as we can to build an integrated program,” Hinkle said. 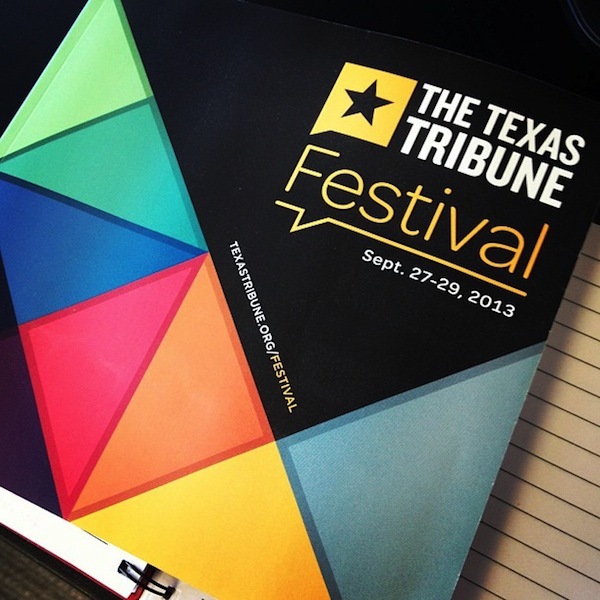 With the exception of The Texas Tribune Festival, all of the Tribune’s events are free and open to the public. Smith said the idea of treating events as a kind of journalism content was part of the plan for the Tribune from the beginning. “The three keys of the Tribune are access, accountability, and transparency,” Smith said. And events bring all those things together for people in an open setting, Smith said. Smith said they didn’t want to hold members-only talks, or private salons similar to The Washington Post’s ill-fated plans from a few years back. “We’re going to make certain the public is in the room. It’s absolutely on the record and not just open to to people who are donors — but everybody,” he said. Making the events free helps draw an audience, but it also places an extra burden on finding sponsorship dollars. So far, that hasn’t been a problem, Smith said. Most Tribune events rely on a variety of companies, interest groups, and other organizations to foot the bill. “I think what is happening is we are getting traction in this idea that events are content in the same way traditional journalism is content,” Smith said. While the events can help broaden the Tribune’s reach beyond the halls of the statehouse, the intended target remains legislators, state officials, lobbying groups, lawyers, and other industries who have a stake in what happens in Austin. The Texas Tribune Festival is perhaps the best example, the event Smith says: “We refer to it routinely as Woodstock for wonks.” The festival has now expanded to 11 tracks, each of which drill down into issues like education, criminal justice, and the environment. Photo of the 2012 Texas Tribune Festival closing ceremony by Callie Richmond/Texas Tribune used under a Creative Commons license. Photo of 2013 festival programs by Emily Ramshaw. POSTED Sept. 27, 2013, 9:30 a.m.
Ellis, Justin. "What makes the Texas Tribune’s event business so successful?." Nieman Journalism Lab. Nieman Foundation for Journalism at Harvard, 27 Sep. 2013. Web. 24 Apr. 2019. Ellis, Justin. "What makes the Texas Tribune’s event business so successful?." Nieman Journalism Lab. Last modified September 27, 2013. Accessed April 24, 2019. https://www.niemanlab.org/2013/09/what-makes-the-texas-tribunes-event-business-so-successful/. | title = What makes the Texas Tribune’s event business so successful?